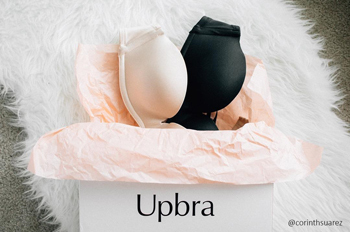 We size Upbra bras to be as convenient as possible. Over the past 3 years, we've made hundreds of modifications to each bra size we make and we continue to adjust and improve each size we make. But our core philosophy is that most women are familiar with the 3 major brand bras in the world and we do our best to make sure our bra sizes align with those major brands. If you normally wear a 36B in other brand bras, you should get a 36B Upbra bra. Another advantage to having compatible bra sizing is that when we talk with customers on the phone, or in chat, our specialists can start off by asking "have you used the Upbra Mobile Bra Size Calculatorto find your size" and if not, they can ask what size she is in one of the major brands. It would be a major inconvenience and hurdle to our customers if we went off and sized our bras differently. Instead of trying to size bras differently, we try to size them better. It is important that Upbra bras fit well, so we have multiple ways for you to measure yourself or get the sizing help you need: the Upbra fit quiz, Upbra mobile sizing app, and personalized help from our sizing experts. No measuring tapes, complicated size calculators or convoluted bra size charts. Just answer a few simple questions about the bra that you currently wear. That’s it! Our algorithms use your answers to recommend what size Upbra bra would work for you. You can find the Upbra fit quiz here. A new way to get your bra size measurements. After a year of testing with over 8,000 women, and six months of beta testing in the app store, we're introducing the Upbra Mobile Bra Size Calculator- the simplest bra size finder ever. Use your phone to get your bra size in just a minute. Since you will only need it once, you don't need to download anything. Just run the Upbra Mobile Bra Size Calculator instant app through your phone's web browser. No measuring tape, no camera, no memory, no downloading. You can try the Upbra mobile sizing app here. Our fit experts are here to help. If the fit quiz or mobile sizing app still have you unsure, just contact our experts for one on one fit help. We’re available M-F from 9am to 4pm PST via phone, e-mail, and online chat! You can give us a call at 213-884-4980, email us at office@upbra.net, or find our live chat (when available) in the bottom corner of your screen! We see women all the time who are a perfect 33B or 35C or 31C. The great thing is that since we tweaked the design for each of our line of Upbra bras around real women, we can fit a greater range of sizes without adding more confusion in the shopping process. In general, we suggest to our customers that if they are in-between sizes, they should choose an Upbra in a smaller band and a larger cup. For example, if you measure as a 33B, we suggest you get a 32C Upbra bra. If you measure 35C, we suggest you get a 34D. We constantly test our fit, sizing, and the cleavage and lift performance on all of our bras. Unlike most brands, we also make constant improvements to our designs. We test sizing and performance on real women, on models, on friends and on our employees. Constantly. Over the past 3 years, by listening to our testers, and to our customers, we've improved the cleavage and lift performance of all of the Upbra styles, as well as improving the comfort and fit. It is a never ending process. We don't just call up a factory in China and ask for a new design. We design and manufacture everything in our own factories in Northern California. Another point is our focus on excellence. We only have one strapless bra, one convertible bra, one T-shirt bra, one style of swim top and as we launch our next series of styles, there will only be one of each of those too. We focus all of our expertise on creating best-in-class bras. The one Stay-up Strapless bra we offer is the best strapless bra out there. It provides amazing cleavage for small sizes, and then amazing lift for larger sizes, and because of the way it distributes the forces evenly around the body, it stays up better than any other strapless bra. Every aspect of every Upbra bra has been designed based on customer input, and we still ask ourselves every day what can we do better. We welcome feedback, and encourage our customers to let us know their real opinions and input.